Whatever you may be looking for in a VPN service, it is more than likely that you can find it in CyberGhost VPN. This service uses state-of-the-art encryption, keeps no logs of your activity, allows torrenting, lets you use the service on up to 5 devices simultaneously, boasts great compatibility, provides excellent speeds, imposes no limits on bandwidth and traffic, and operates more than 1,300 servers in 51 world countries. The best part? Its list of advantages does not end there. It offers some pretty useful extra features as well, including but not limited to an Internet kill switch, ad-blocker, anti-tracking, malware blocker, DNS leak protection, and IPv6 leak protection. Now let us find out how much it costs to use this outstanding VPN. 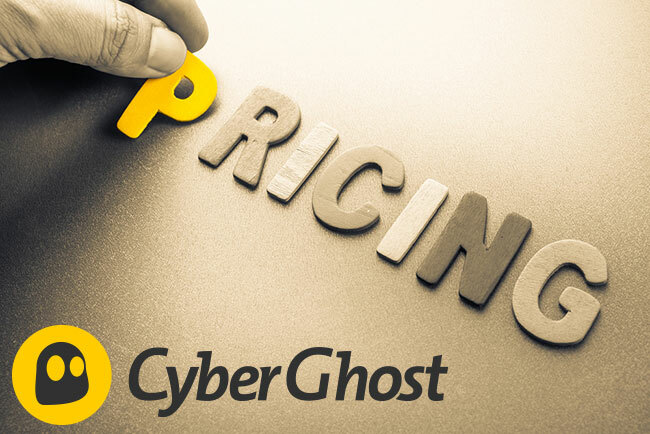 CyberGhost’s monthly subscription is not too affordable and costs $11.99 per month. However, if you opt for the annual subscription, you pay only $5.99 per month, so you get to save $72 per year. The bi-annual plan brings you even greater savings, as it costs just $3.50 per month. It is worth noting that CyberGhost often offers pretty good deals on its subscriptions so you can save even more cash on your purchase. No matter which plan you choose, you get to test the service with the 7-day free trial. Not only that, but thanks to the 30-day satisfaction guarantee, you get a whole month to decide whether you are happy with your new VPN or you want your money back. As far as payment options are concerned, CyberGhost accepts all major credit cards including Visa and MasterCard and you can pay via PayPal as well. Users who want to stay completely anonymous might be happy to hear that the service accepts Bitcoin as a means of payment. Want to find out even more about CyberGhost? Make sure to check out our CyberGhost Review for detailed information about this VPN provider.